In the past, people missing all of their teeth had no option but dentures. New technologies and dental implants make replacing all your teeth, even in a day, now possible. People call this exciting procedure ‘all on four‘ dental implants, or ‘teeth in a day’ via ‘all on four.’ It’s exciting, and it may be for you. In fact, we have people coming from all over the San Francisco Bay Area to experience the all in four dental implant procedure. 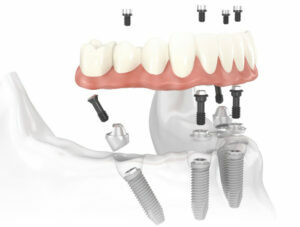 Here’s an explanation for how ‘all on four’ works using dental implants. “All-on-four” technology means that we can use a minimum of 4 dental plants that are often angled to engage existing bone in order to attach a bridge that replaces all of the teeth on that jaw. When people lose teeth, they lose the bone that was there to support their teeth along with the teeth themselves. That’s why prior to “all-on-four” dental implant technology patients needed extensive bone grafting in other to place multiple implants throughout the jaw. This bone grafting required an additional surgery, sometimes it required taking bone from the hip or leg. Bone grafting had to consolidate for several months prior to implants being placed. After implants were placed, more time was needed before teeth could be attached to the implants. It often took well over a year from the time the patient started treatment to the time they actually got teeth! With “all-on- four” technology, using 3-d imaging (a CT scan that Dr. Rabinovich has in his office) we can utilize the bone that is available ( with little or no bone grafting) and place 4-6 implants per jaw. 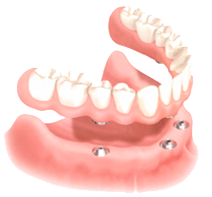 A temporary bridge replacing all the teeth on that jaw can be attached to the new implants on the same day (so-called ‘teeth in a day‘) because the load is shared between all of the implants so they can be utilized immediately. Dr. Rabinovich prefers to place more than 4 implants because if 4 are placed and at least one of them fails at some point, a bridge can no longer be utilized and additional implants are needed. If 5 or 6 implants are placed that situation is less likely. Our San Francisco office is very convenient, so please reach out for a consultation to see if this procedure is right for you. Every person is different, and you may not need all your teeth replaced. But find out if ‘all on four’ is truly for you. Call the San Francisco Dental Implant Center today at (415) 992-9188, or email us at info@doctorrabinovich.com.